Póngase en contacto con el propietario para cualquier solicitud especial, reservas o alquileres mensuales. Esta casa está hermosamente decorada y es cómoda, luminosa y espaciosa, con pisos de madera en todas partes. La casa y sus alrededores son pacíficos. Rutas de senderismo a la vuelta de la esquina. La terraza del patio tiene un toldo retráctil, la cubierta frontal es ideal para relajarse y disfrutar de los días de verano. Un paseo por la cuadra y estás en la playa privada. Después de un día agradable en la playa, regrese a casa y use la hermosa ducha de cedro al aire libre. Un corto viaje en coche y estás en el corazón de Vineyard Row, todas las bodegas locales. Minutos de distancia, el pueblo de Greenport y el famoso Love Lane de Mattituck, donde los viernes por la noche, una feria de calle se lleva a cabo con música en vivo y todos los restaurantes están abiertos con comida y bebida, incluyendo la tienda Love Lane Cheese. We’ve been getting together for the last 18 years for our girls weekend. This year we decided to spend it out east. How lucky were we to find Kristie’s home. Her home was very clean, comfortable and cozy. Kristie was very responsive and accommodating. We look forward to spending future get togethers here. Thank you, Kristie!!! Great house, location and owner. Thanks for a great and productive stay. Great home in LI Wine Country! This was the cleanest most well equipped home we have ever rented! Great location to everything and just a short walk to the end of the road is the beach. Kristie was responsive and gave us great ideas on new places to go! Just perfect! We can’t wait until next year to return!! Where do I even begin...everything about this house was amazing. From the decor to the location, we couldn't have asked for better accommodations during our stay in Southold for a wedding. It was literally five minutes from the wedding venue, and everything else of interest wasn't too far behind either (wineries, farms , restaurants, coffee shops all within a 10 minute drive). Kristie was very responsive, and checked in with us multiple times prior to and during our stay. She was also very accommodating when our group grew by two at the last minute. One thing I would like to point out about the house (I didn't realized how important this minor thing was to me prior to our stay) was the water pressure! Every shower felt like a massage! Small thing, I know, but it made a big difference. All in all I would highly recommend this beautiful home to anyone traveling to the Southold area. We also plan to make a return visit in the near future. Thank you, Kristie! Our family really enjoyed staying at Kristie's house this summer. The house is really large, well-laid out (it has 4 large bedrooms, large living room and large dining room), and fully renovated. There is a large, comfortable deck and large grassy back-yard. The beach is a 5 minute walk from the house and all the North Fork attractions are a short drive away. 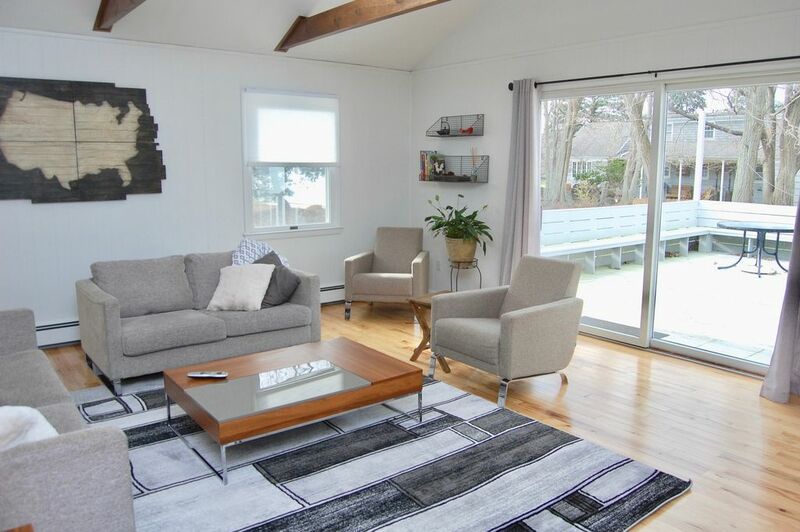 If you are looking to spend some time in the North Fork I would strongly recommend this house! Kristie's property was nothing short of spectacular! The house was clean, beautiful and fully stocked with all necessary amenities. It was a great size for 6 adults and 2 children (ages 7 and under). We enjoyed sitting out on her massive deck and walking down to the private beach. My girls had the best time collecting endless amounts of shells! Kristie's house is the perfect distance to town (with a supermarket and pharmacy) and also surrounding neighborhoods. We took day trips to Mattituck and Greenport during our stay. Thank you for letting us enjoy your little slice of heaven! It truly was such a relaxing vacation!